This page is to send newsletters to your subscribers. In this page you have options to select newsletter subject, subscribers group and subscribers email. 1. Select newsletters subject which you created on compose page. Only Static Templates are displayed in this page. 2. Select Mail Type, If you have lots of email address, I strongly recommend you to use “Send mail via cron job” option to send your newsletters. In this option plugin will not send a mail immediately instead it will send whenever your cron URL triggered. 3. Select subscribers group. 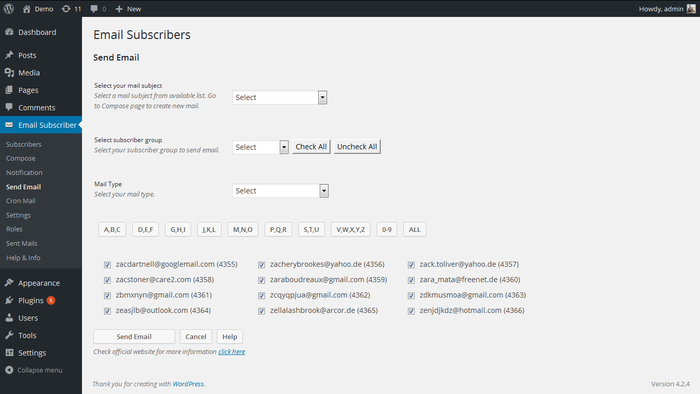 In this plugin each subscriber’s emails are stored into particular group. Default group is Public. 4. After you selected subscribers group you can find all the subscribers emails with a check box option. If you don’t want to mail any particular subscriber(s), you can uncheck the email(s) on this list. 5. Finally click Send Mail button to send a newsletters. Optionally you have alphabetized batch sending. If you have lots of subscribers in your blog, you can select alphabets to display email address. This plugin offers a new option to view sent newsletter details with mail preview. 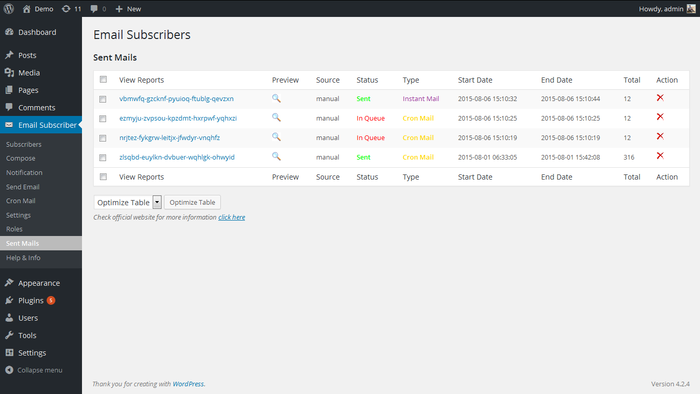 Also in that page you have options to check newsletter status whether your newsletters are being read or not. Click Sent Mail menu in your dashboard to view the details. Click Optimize Button in this page to delete old records from your database. It will delete all old records except latest 10.